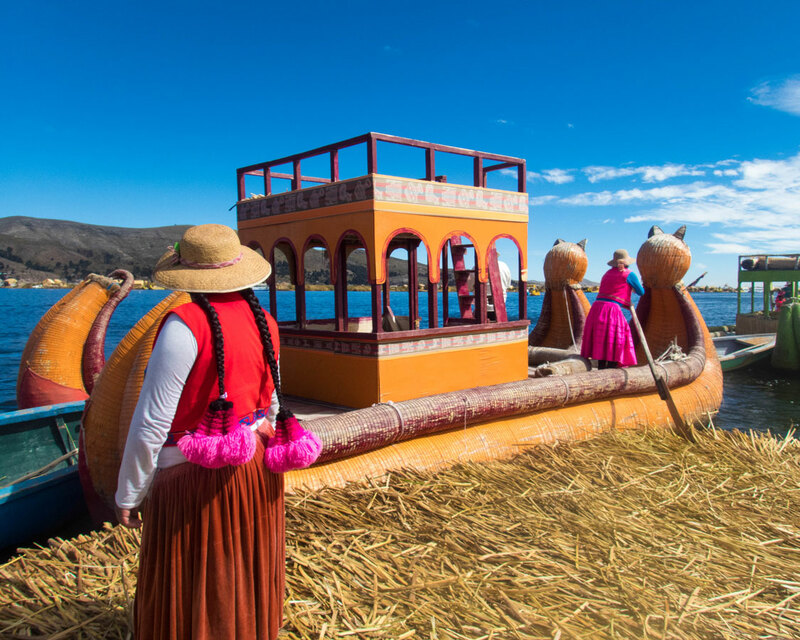 Straddling the borders of Bolivia and Peru, Lake Titicaca has become one of the most famous lakes in the world. And this reputation is justly deserved. With a surface elevation of 3,812 meters (12,507 ft), Lake Titicaca is considered to be the highest navigable lake in the world. Also, the lake is considered the birthplace of the Inca. And in addition, there are unique and diverse cultures spread across the various islands of this huge lake. As we were visiting Lake Titicaca off a road trip from Cusco and the Sacred Valley, Peru, we explored the Peruvian side. 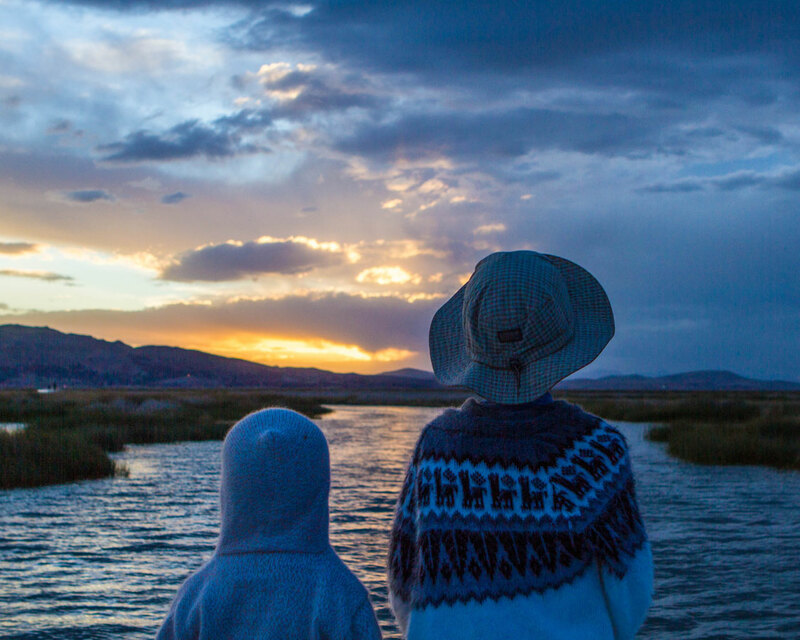 It quickly became clear to us just how special this place is as we prepared to explore Lake Titicaca with kids. Our journey from Cusco to Puno, which is the gateway to Lake Titicaca, began when we joined a bus tour from Cusco. We had already spent some time exploring the many things to do in Peru. We had visited Cusco and the Sacred Valley, Machu Picchu, and Lima. The bus trip from Cusco gave us a deeper perspective on the incredible culture and beauty that lies beyond the most famous regions of Peru. Our route, booked with IncaExpress, via Kuoda Travel, took us along the so-called “Route of the Sun”. On the bus ride we saw the Andahuaylillas Church, the Raqchi Inca remains, and the Pukara Museum. Pro-Tip: You can read all about our visit to Machu Picchu with kids here. The sun was setting as we arrived in Puno. 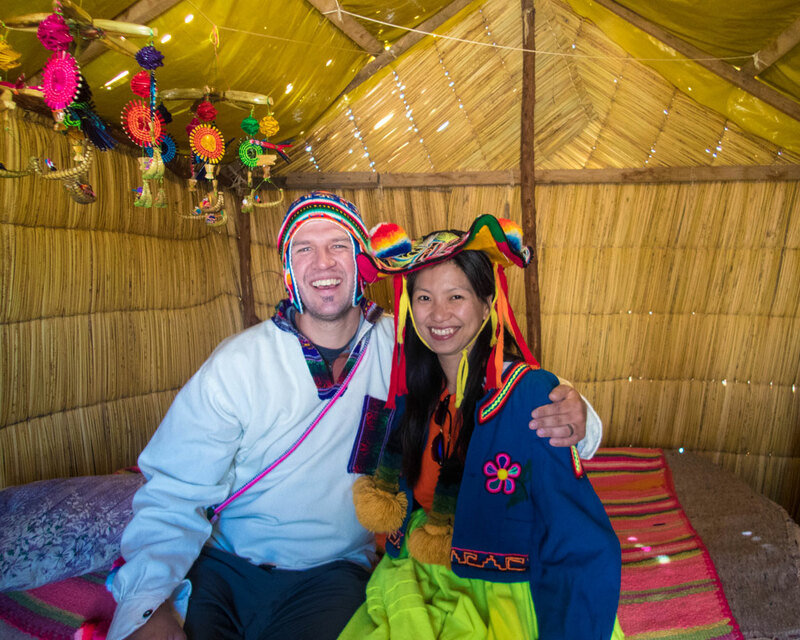 We were met by our guide from Kuoda Travel and whisked off to the Libertador Hotel Lago Titicaca. We had enough time to get ourselves checked in before heading back to Puno for a meal at Mojsa Bar. Mojsa is a small restaurant that is popular with both locals and tourists alike. We split dishes of bruschetta, fresh trout ceviche, and alpaca steak with the kids and finished with some delicious ice cream and creme brulee. The next day I woke up at about 5 am to catch the sunrise over the lake. The sky was perfect, and despite getting misplaced trying to find the best angle for the sunrise, and having to scale a small cliff to fix the situation, it was an amazing way to start the day. I met back up with Christina and the boys for a buffet breakfast at the hotel. After a hearty meal, we got ready to face the day. 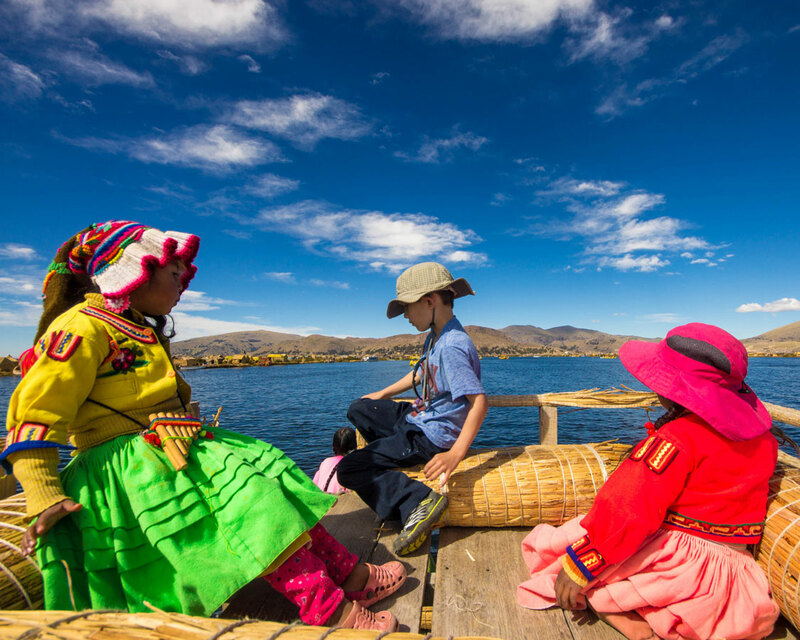 Our visit to Lake Titicaca with kids stands out as one of our most incredible cultural experiences. 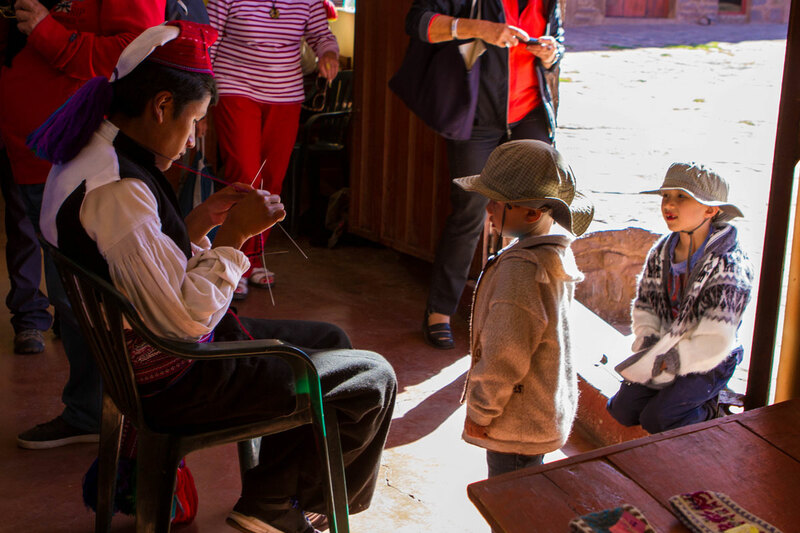 Between our visit to the Isla de los Uros and our stop on Isla Taquile, our boys had the chance to interact and play with children living two dramatically different lifestyles. 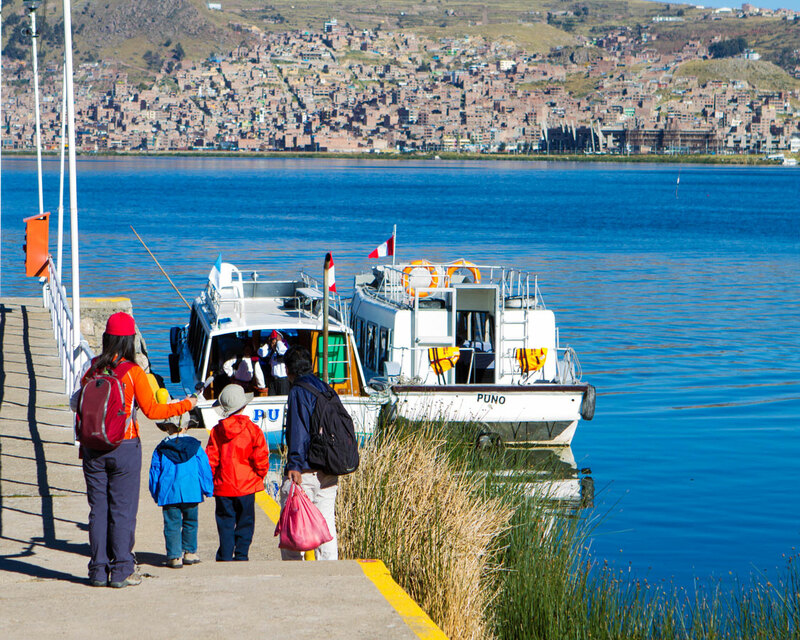 We met our Kuoda Travel guide and made our way down to the Libertador marina for our tour of Lake Titicaca with kids. The boat operators were two teenaged boys wearing black pants and vests over a white wool shirt, brightly colored woven belts and colorful hats with a single tassel coming from the center. We learned that they were Taquileanos, residents of Isla Taquile, which we would be visiting later that day. 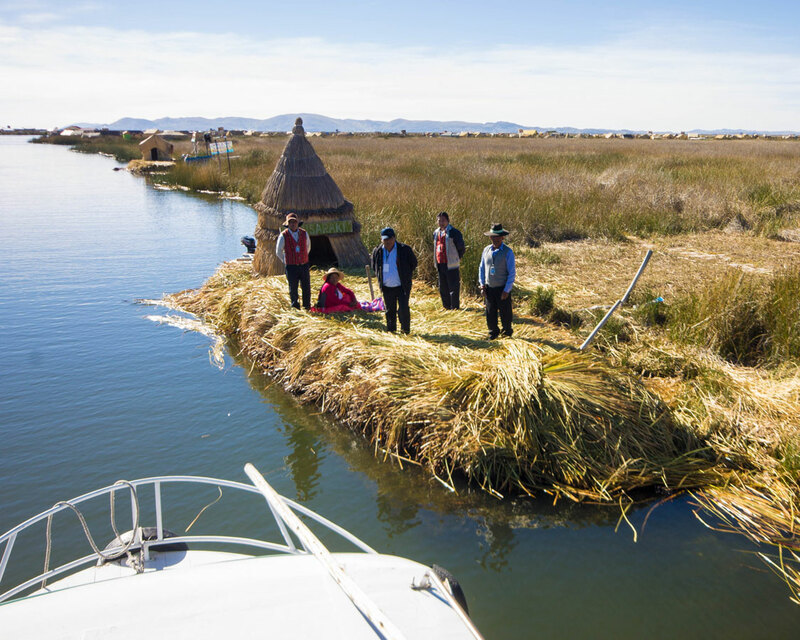 But first, we were heading to the reed islands of Uros on Lake Titicaca. 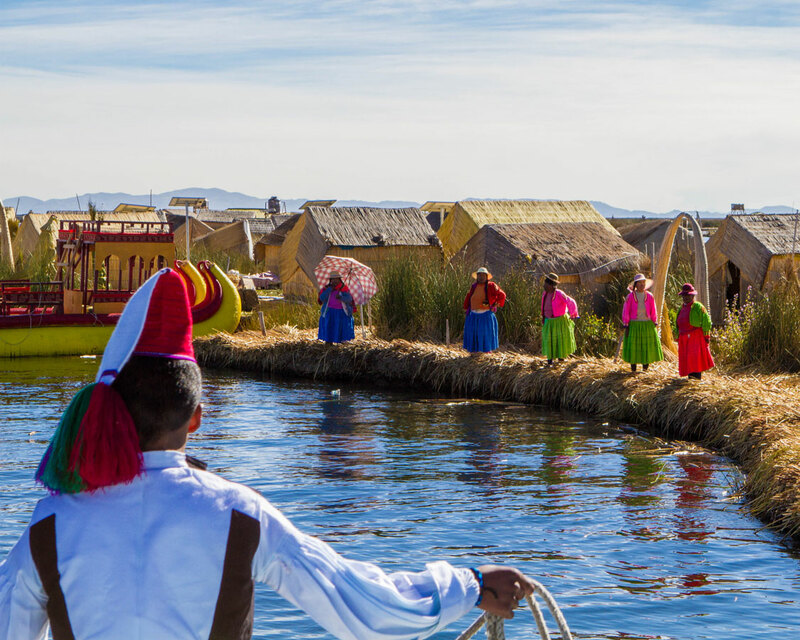 The Uros Islands are floating islands in Lake Titicaca. 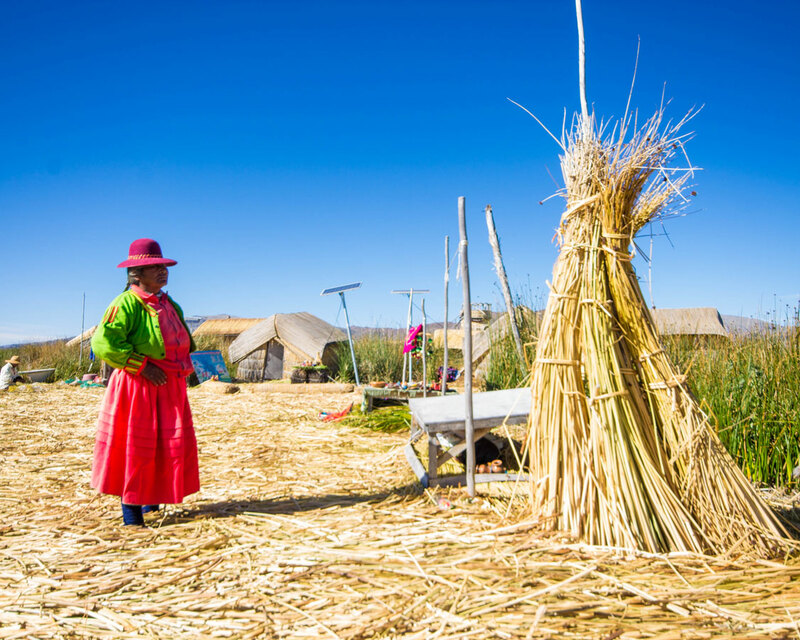 The Uros live on approximately 40 self-made floating islands made from Totora reeds. 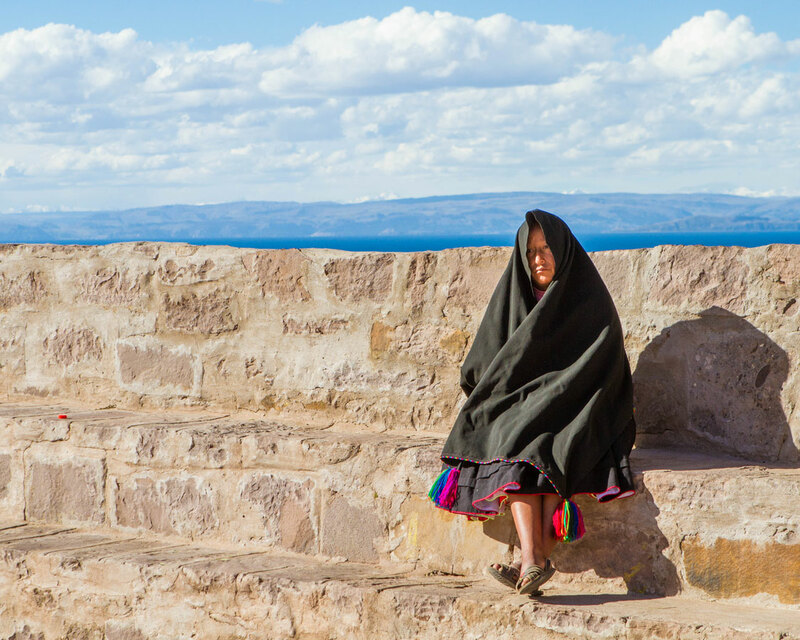 Both the Bolivian side of the lake and the Peruvian side are home to distinct groups of Uru people. And their lifestyle is unique, the Uru people have been living in this way for around 1,000 years. As we made our way through the reeds into Lake Titicaca, we were amazed at how peaceful the area is. Small fishing boats buzzed in and out of the channels and the occasional tourist boat passed by. But considering that Puno is a city of almost 150,000 people, the region seemed downright peaceful. Our boat, a large tourism craft, was easily capable of holding 60 people. But only our family, our guide and the two Taquileano crew boarded. We pulled up to a small reed island staffed with about 5 Uru (The Uru people are the culture who live on the Uros Islands in Lake Titicaca). 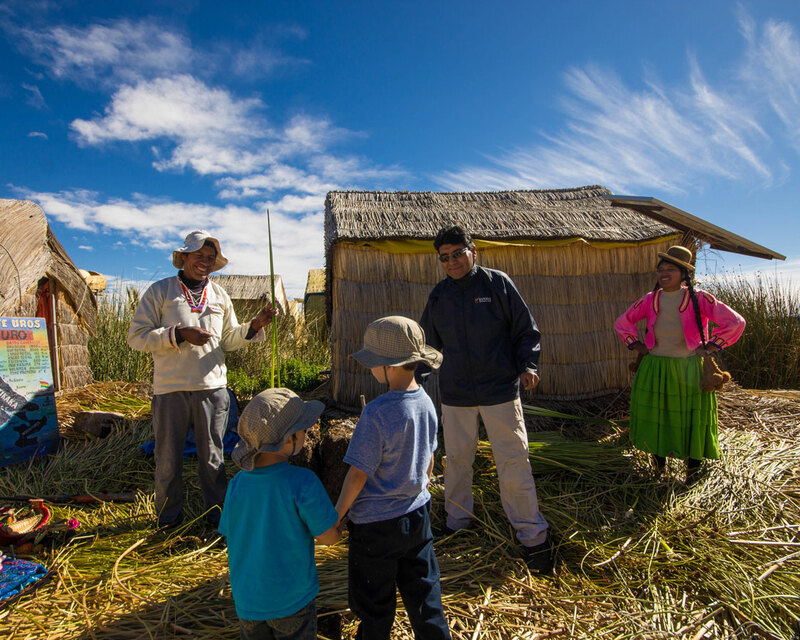 They greeted us and collected the entrance fees for visitors to the Uros reed islands on Lake Titicaca. Approaching one of the islands, we were greeted by a group of women in colorful traditional clothing. Their garb included colorful wool sweaters, layered skirts, and bowler hats. The brightness of the clothing is what set them apart from the traditionally dressed women found throughout Peru. The fantastic colors brightened our moods even more as we disembarked and were greeted warmly by the women. 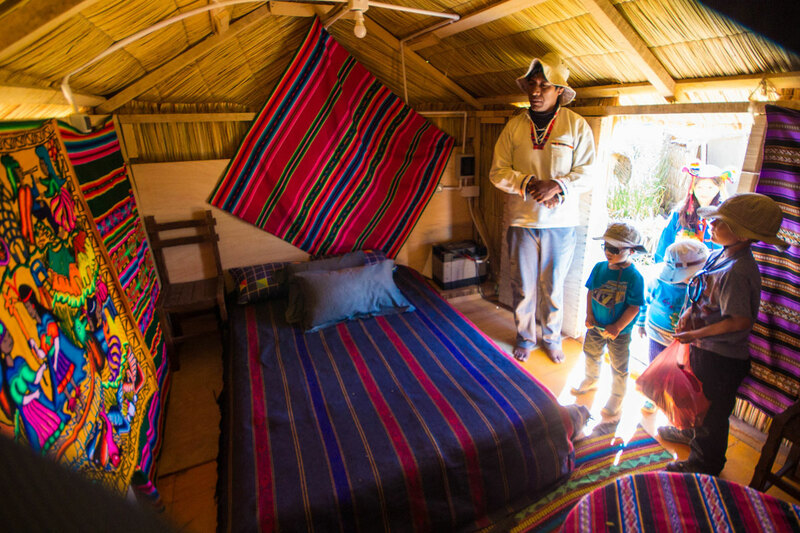 After being welcomed we sat down with the island’s “President” to learn about life on Isla de los Uros. We were shown how the reed islands were made, using soil and Totora reeds that are dried and layered in a criss-cross pattern. Each island can survive about 10 years before it sinks too low in the water and needs to be replaced. Each island houses between 3 and 10 families, although families may “cut off” and relocate to other islands from time to time. The president welcomed us into his home and gave me the honor of taking on the role of the Uros president for the day. I was dressed in a traditional sweater, sack, and hat. While Christina was dressed as a beautiful “First Lady” in a colorful flat hat and skirt. Learning about the role of the people of the islands was enlightening. Our chat even taught us how young couples on these tiny islands found time to escape for some private time on the Balsa boats. As we explored the island, the boys made friends with the local Uru children. 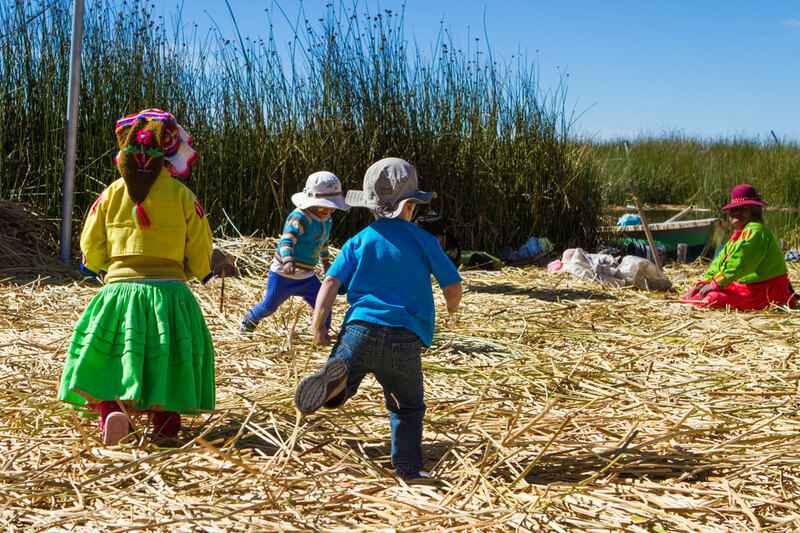 They ran and played among the houses and played games of tag while Christina and I were given a deeper tour of family life on Lake Titicaca. Although the life of the Uru people may seem primitive, they have access to schools and education and many of the islands have solar panels for electricity. The one that we visited even had a hotel that was available for rent for only $63 per night! After a couple of hours on the island, we waved our goodbyes to the President and a few of the other locals on the island. Hopping aboard a Balsa boat for a short ride to the central island of Isla de los Uros. It was possible to take our tour boat to the island, but $20 for an experience on one of the classic and colorful reed boats was too much to pass up. Our ride was made extra special when all the children from the island decided that they hadn’t had enough of us and hopped on board to keep C and D company for the trip. We were very happy to get a little extra time with them as well! The main island in Isla de los Uros is a busy place. 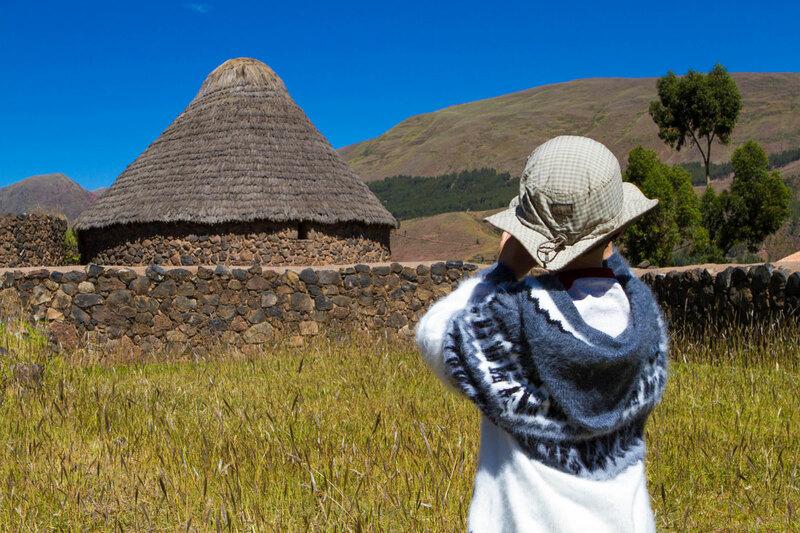 This is where visitors can find a restaurant, the local schools and a small reed house where you can get your passport stamped with the coveted Lake Titicaca stamp! We stepped onto the island with a cheerful goodbye to our Uru hosts. And after getting our passports stamped, we met our boat for a ride out to Isla Taquile. Taquile is an island that sits about 40 km from Puno. It took us about 2 and a half hours in the boat to make our way out to this hilly island. Isla Taquile is about halfway through the lake to the Bolivian border. The ride out is slow but stunning and offers incredible views of the snow-capped Andes mountains. 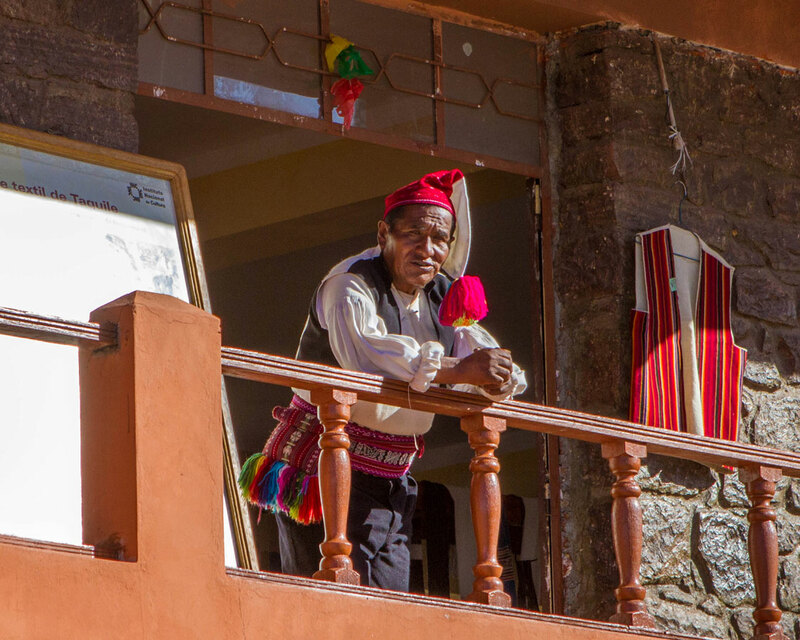 The locals, known as Taquileanos have a culture that has remained relatively unchanged in modern times. The island has no cars, and the locals practice a form of cooperative living focused on farming and tourism. Restaurants take turns opening so that each family has the opportunity to benefit from tourism dollars. The local men dress in black slacks and vests, white shirts and colorful belts and hats, while the women wear traditionally layered skirts, but wear black veils that are often draped over their heads. We were dropped off at Puerto Taquile, one of two main ports for those visiting the island. The island is very hilly, peaking at 4,050 meters (13,287 ft) above sea level. There is an entrance fee to the island, which is usually covered by the cost of a tour. For those visiting independently, the cost is 8 soles. Our visit started with a lunch at one of the local restaurants. But getting there wasn’t easy. We had to climb nearly 200 meters vertical to get to the restaurant. The walk is pretty, with wildflowers covered in butterflies flanking the path, and sheep roaming the trails. But it’s also a tough climb for little ones, and I ended up carrying D most of the way up. We finally arrived at the small restaurant near the top of Isla Taquile. The restaurants on the island are simple, most with tarped patios offering shade from the strong mountain sun. 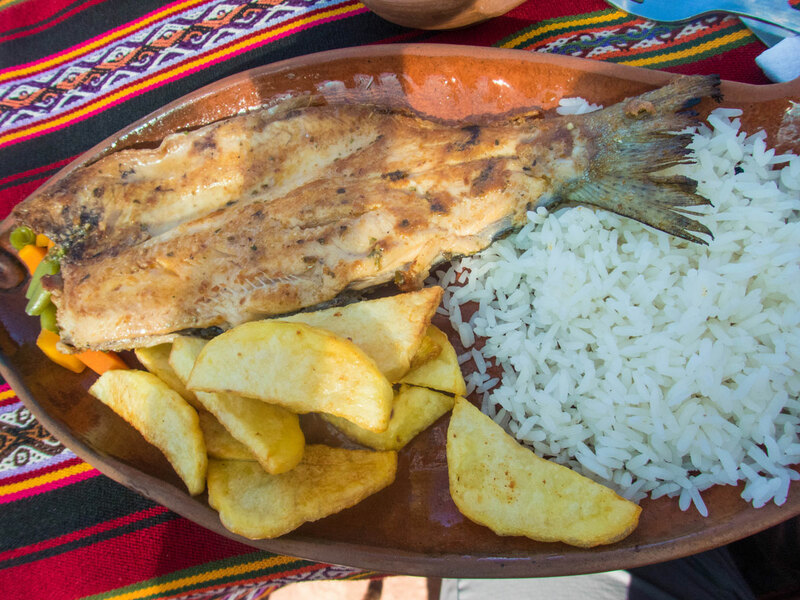 We started our meals with a delicious pumpkin soup followed by the main course of trout, potatoes, and rice. We washed it all down with a refreshing thyme tea. The boys are not big fish eaters, but, whether it was the long day in the sun or the delicious smell of the food, they ravaged their meals. After finishing up our meal, we made our way to the Plaza Taquile. We entered the plaza through one of the many arches found throughout the island, and it was clear that this place was the center of activity on the island. Plaza Taquile is home to one of the two Catholic churches on the island, Iglesia Nuestra Sra, the main visitors center, as well as the handicrafts store. Taquileanos are famous for their handwoven clothing and handicrafts. And as is common with the cooperative culture on the island, there is a clear divide as to what artwork is created by whom. The role of women is to spin and dye wool. While the men are responsible for knitting, a skill that they begin learning early in their childhood. The handicrafts on Taquile are known to be of the highest quality in all of Peru. Next to the handicraft store is the Nuestra Sra Catholic church. This is where the boys found many local children playing marbles on the cobblestone floors. They did their best to play and even won a few rounds. The church itself is an elegant classic adobe building with an accompanying bell tower. 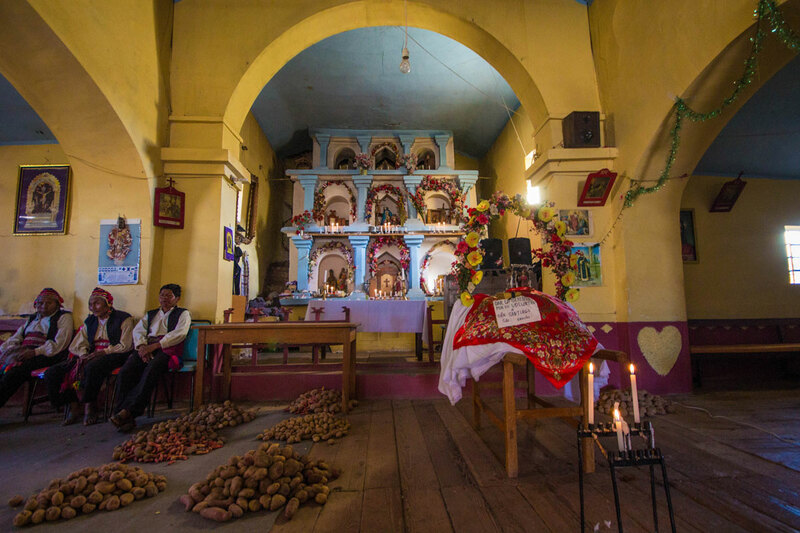 The floor was filled with potatoes and flowered wreaths that made clear the cultural focus of the local people. With the day running on, we began making our way down the opposite side of the island towards Puerto de Ocio. After leaving the town I came across an elderly Taquileanos who asked if I wanted to take a photo of him. Most Taquileanos don’t mind having their photos taken (be sure to ask first, especially when photographing children), elderly members on the island tend to be among the few who ask for a few soles. I was happy to oblige. We boarded our boat back to Puno in time to catch a brilliant sunset light up the sky over the lake. We spent time chatting about all the things to do in Puno, Peru. But before long we were just relaxing on the roof of the boat snapping family selfies and enjoying the chilly mountain breeze. When we arrived back at the Libertador we were too tired to head into Puno for a meal. A simple room-service meal was in order. Both kids were fast asleep before they could even finish their meals. I have to say, I’d always wondered where Titicaca was, so you’ve helped me solve that dilemma. It looks stunning, whether with family or alone. It’s definitely been on my bucket list and even more so now. What an amazing and colourful place! How lucky your kids are to experience such a beautiful country and to learn about a different culture. This looks like a wonderful experience. Nature, history and the beautiful lake. The people seem to be proud and actually gain from tourism. I hope it stays that way because this looks like an amazing tour and adventure. 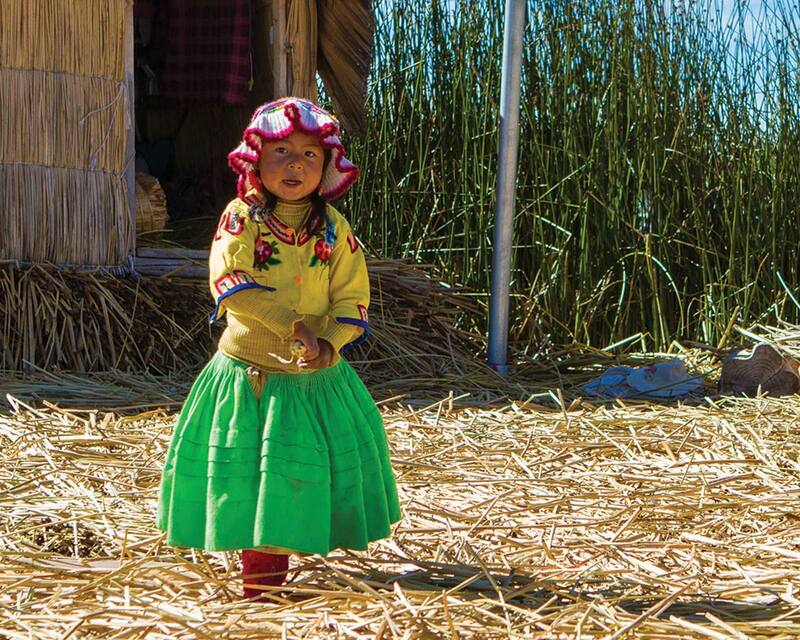 Love that photo of the little girl, Peru is definitely on my list of places that I absolutely want to visit! I’ve heard that the people are so kind and hospitable. Thank you! She was adorable and really got along well with our kids. Everyone we met in Peru was incredibly friendly, helpful and caring. What an amazing experience for your kids! Aside from Colombia, we haven’t ventured into South America much but hope to in the near future. 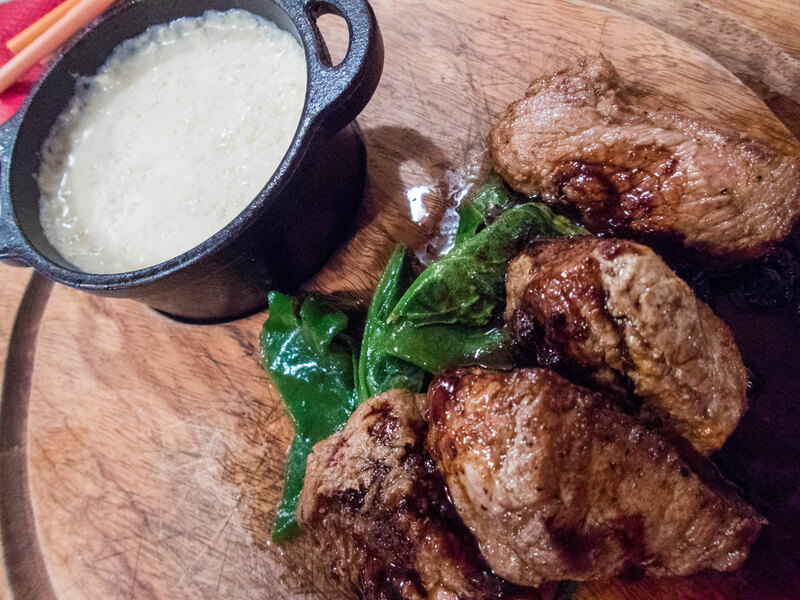 That alpaca steak looks so good! Something my daughter would definitely love. Lake Titicaca is such a beautiful piece of nature. I am intrigued by the food and handicrafts of Isla Taquile. Lake Titicaca is such a beautiful piece of nature. I am intrigued by the food and handicrafts of Isla Taquile. Must have been a wonderful experience. Cheers!! Your photos are SO beautiful! I will show this article to a friend who has recently had a little girl and was afraid she wasn’t going to travel anymore! I’ve had the best memories of my childhood when I was traveling with my parents and sister!!! You have the most well-travelled kids! It’s good to know they got a lot out of visiting Lake Titicaca. It’s not the first destination that comes to mind for family travel but it’s great to see you’ve had a ball. We really did have a ball! They love to travel, even more so when they have local children to play with! Such a lovely interaction with locals. Their attire is indeed interesting and colorful. I liked how the local kids joined to give company to your sons. The food seems so similar to Indian food. Ahhh, Lake Titicaca. Finally a story and pictures about it. Thanks…so colorful, so interesting! I stayed in Puno, too, and found it a great base. But oh, the vicious altitude sickness. It wasn’t until I started climbing up to Isla Taquile that it went away. I think it was breathing hard that cured me. Such as stunning region. I visited Lake Titicaca a long time ago before I had kids. I can imagine with kids it’s a whole new experience, I’d love to take my 3 year old. 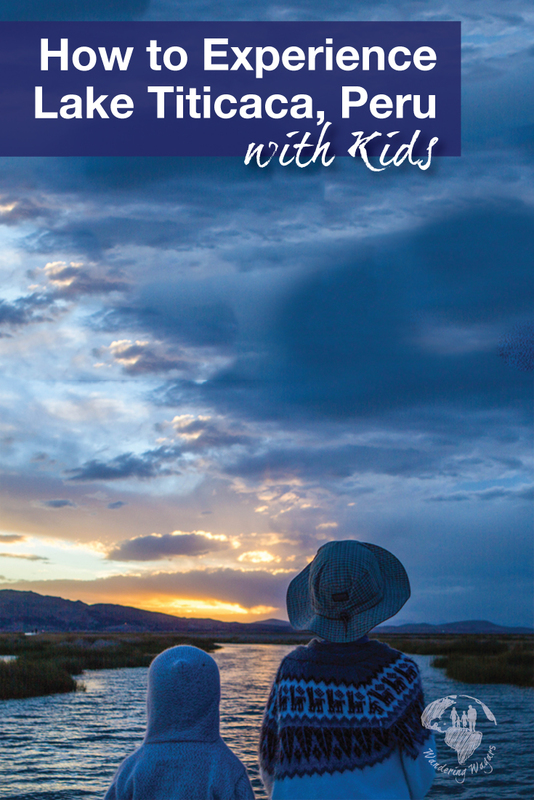 The tour over to Isla de los Uros looks fun, the local people must love seeing foreign kids. We are considering a trip to Peru with the kids! What an amazing culture. Can you feel the reed island…moving? Does the ‘ground’ feel hard under your feet or does it give some? I’ve been wondering about that! What a cool experience. You can indeed feel them moving when you first step foot on the islands. It feels really weird at first, but after a few minutes, you barely notice it anymore. But if you jump, you can watch the waves ripple the entire island. I went to Lake Titicaca from Bolivia and visited Isla del Sol. 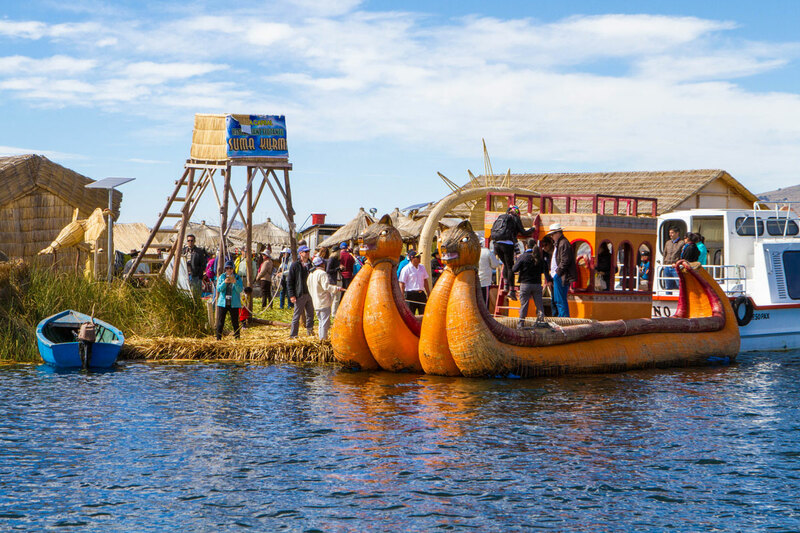 Sadly, I could not go to the Uros Islands…it looks like a fun place, especially with kids. I loved the idea of the ‘President’… pretty interesting. It is nice to see social dynamics in these islands. Thanks for sharing! wow, what a unique experience. 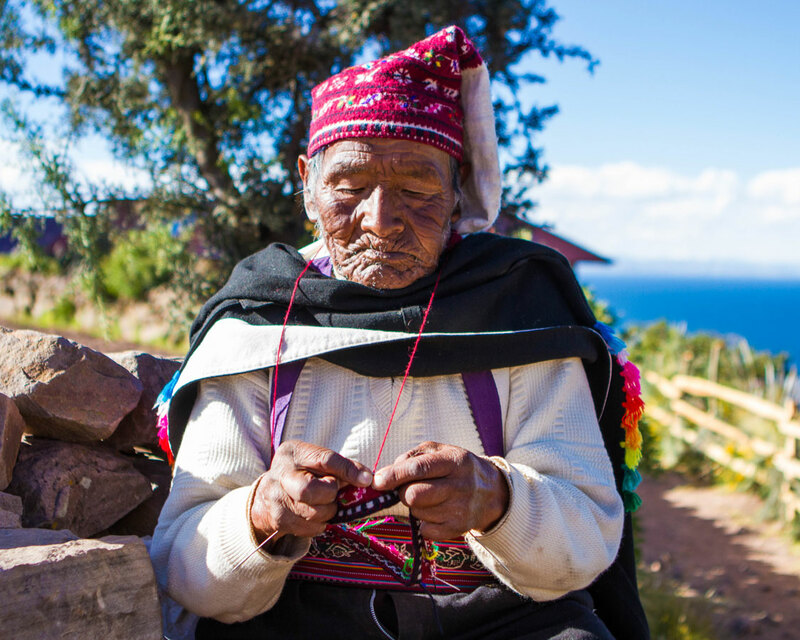 You are so lucky to have spent so much time with the locals to really understand what it is like living on Lake Titicaca. The lake has such an important history, and I had no idea that it was at such a high elevation. Over 12,000 feet? That’s crazy high! What a beautiful journey! I sadly missed out on Lake Titicaca when I was in Peru, but I won’t make that mistake again. Isla Taquil looks absolutely incredible. 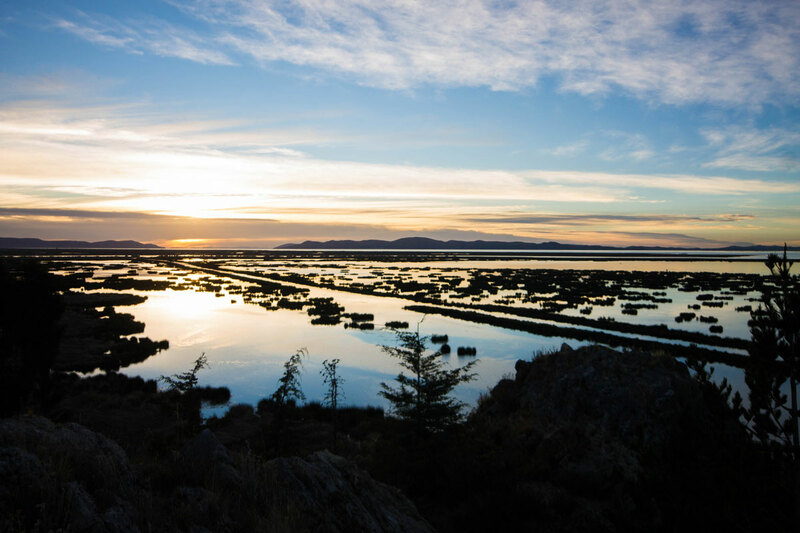 Impressive coverage of the Lake Titicaca area! I didn’t know much about it and really appreciated all of your information, photos, and feelings about the islands and tours. I was most impressed, however, with the kindness of the people you interacted with. Surely an amazing experience! 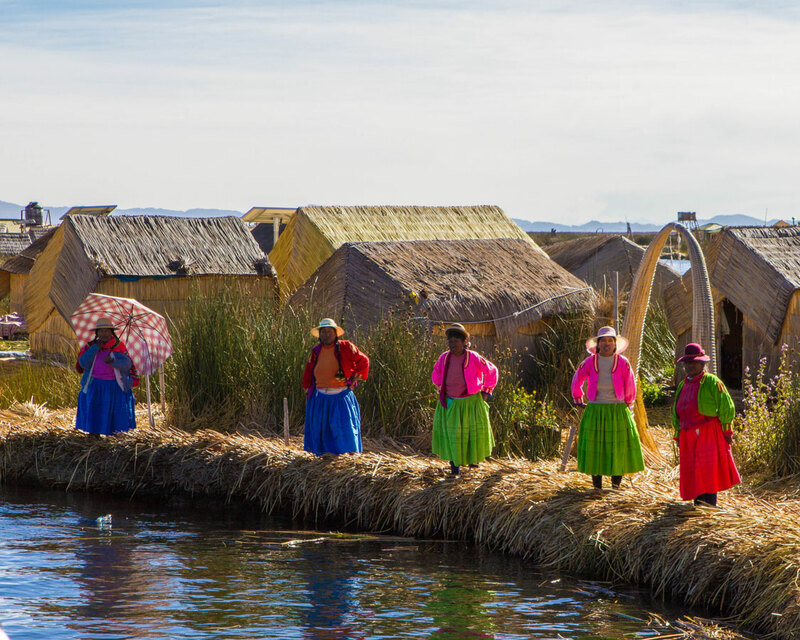 I loved The Uros Islands and the landscape with indigenous people. It feels great to see how they welcomed you and made You “President for the day”. The colorful costume, food and the warm hospitality of the people make every trip exceptional. Traveling with kids and exploring places like these make it a unique experience. I loved each photograph. I can’t wait to visit Lake Titcaca and visit surroundings. I absolutely loved all the photos. I noticed especially how brightly colored their outfits are and I love the colors. Island friends tops it. My 4yr old makes lots of friends when we travel also. I didn’t know anything about Lake Titicaca. What an incredible experience you had immersing yourselves in the local culture and community. We may think of their culture as primitive. In actuality, their cooperative way of living, reed islands and the use of solar panels is probably good for the environment. Wow! That is an amazing experience! It is always nice to experience first-learn and learn about a different culture. I loved the Balsa boat and the lovely little children from the island. Hi Kevin, we are planing to go there in a couple of months with our kids, 19 months & 5 years old then. But we are still wondering if we should, because of the altitude… How did you and specially your kids managed this? No altitude sickness? How old were they? I would highly appreciate your experienced recommendations on this topic! Thanks in advance. Hello Rosa, Our children were 3 and 5 when we went to Peru. We had no issues with the altitude. Before we made our way to Puno we spent some time in the Sacred Valley to adjust. From there we went to Machu Picchu, and then by the time we reached Cusco, we were well acclimated to the altitude. 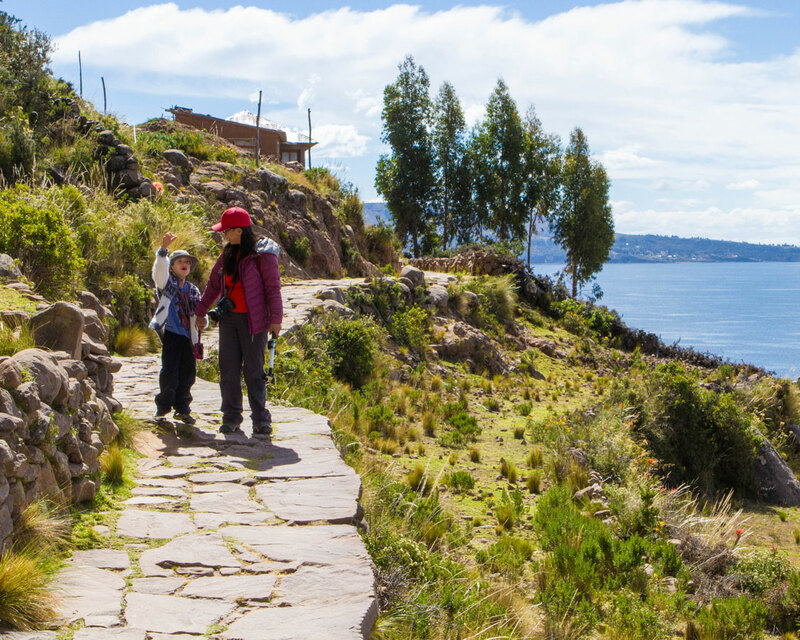 If you plan on visiting Lake Titicaca right away then you may have some concerns, but if you give yourself time to acclimate, you should be good. With that in mind, it’s also good to remember that everyone deals with altitude differently. It may be worth speaking to your doctor about having altitude sickness medication on hand if you need it. There are also places in the major cities have oxygen available.